The original Can Am series began in 1966. It was based on a set of rules that allowed for technological innovation. However, this technical freedom resulted in escalating costs which contributed to the demise of the series in 1974. However, there was still a demand for Can Am cars from fans and promoters and the series was revived in 1977. The new rules were not as liberal as the original series. 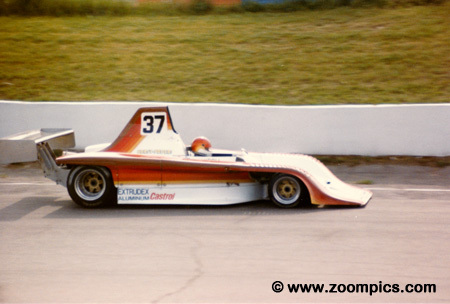 The second generation Can Am cars were based mainly on the former Formula 5000 category and under 2-liter sports racers. But the revived series also ran its course and ended in 1986. 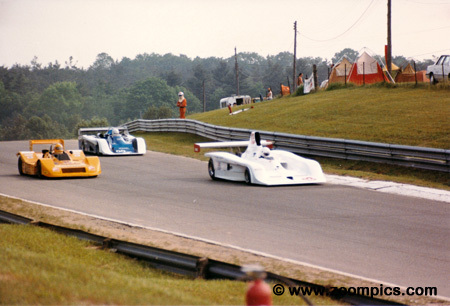 Many of the well-established and funded Can Am teams transitioned to the CART and IMSA series. This resulted in low car counts and a general lack of interest in the series. 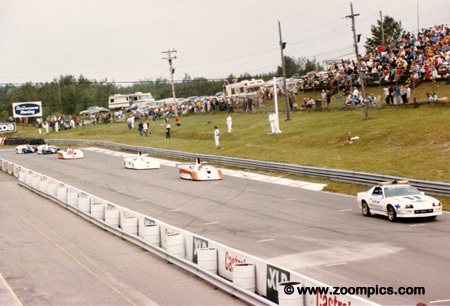 The final season consisted of four races - two at Mosport and the others were at Summit Point and St. Louis. 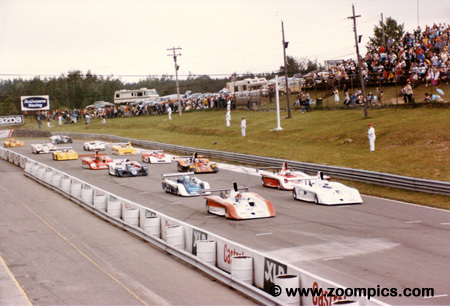 The first race of the last season took place in June at Mosport. Below are images from this event. On the front row was Horst Kroll in No. 36 Frissbee KR3. Qualifying second, over 1.5-seconds slower, was Al Lamb in a Frissbee GR2. Fastest of the under 2-liter cars was Jeremy Hill in Photon JH2. In total, there were fifteen starters. Pre-season 'hype' suggested that there would be twenty-five entries for the June event and an additional fifteen for the September race. 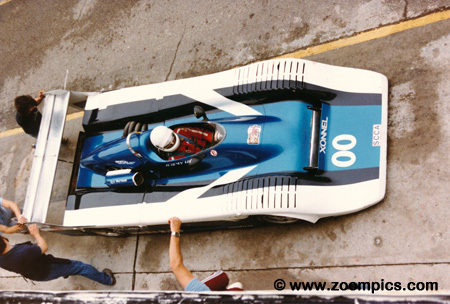 Mosport veteran, Horst Kroll won round one of the 1986 Can Am Championship. He would never finish any worse than sixth during the season. It seemed only fitting that Kroll would win the final championship. He had competed in seventy races since the series was revived 10-years earlier. Lou Sell, the 1968 SCCA Formula A champion, debuted a re-bodied March 85C that was driven by Michael Andretti in the CART series. The former CART cars took advantage of 6-liter engines and Indy chassis technology. Problems during qualifying forced Sell to start at the back. During the race engine problems developed causing him to complete only thirty-two of the scheduled forty-five lap event. 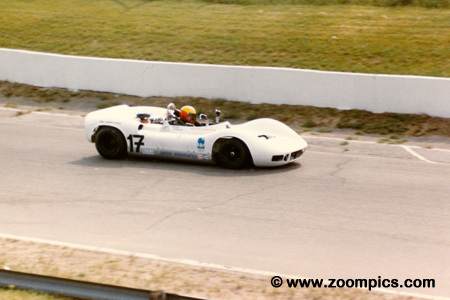 What appears to be a mid-60s McLaren M1B is a converted Formula Atlantic March powered by a Mazda 13B Rotary engine. This car raced by Sean Burgess was called March RX10-B Mazda. Burgess qualified twelfth but did not finish. At the second Mosport race in September, he would fare much better finishing sixth overall. 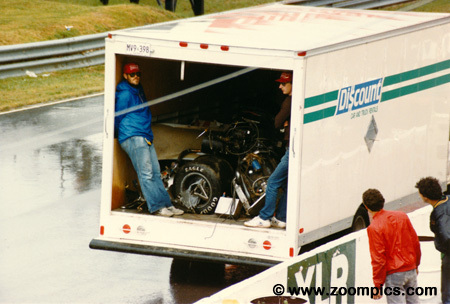 On the fifth lap, a mechanical failure on Frank Chiannelli’s converted March caused him to go over the guardrail on Mosport’s very fast back straight. 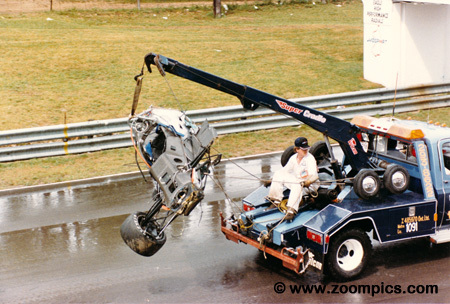 The back half of the car - engine and rear suspension - separated from the tub. Chiannelli was stiff after the accident but uninjured. Not sure if the racing adage - "A bad day at the track is better than a good day at work" - applies here. The damage to the guardrail caused by Chiannelli’s accident resulted in a 90-minute delay. This stoppage also allowed competitors to change to rain tires as there was a sudden downpour. These factors contributed to the race being reduced from sixty to forty-five laps. 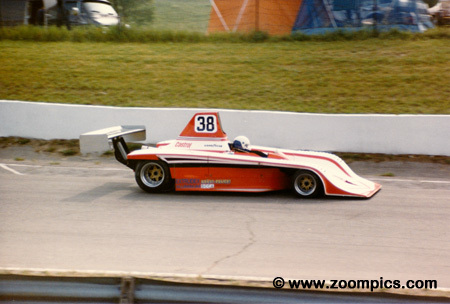 Jeremy Hill converted his Formula Atlantic March 78 to Can Am specifications and called the car a Photon JH2. The quickest of the 2-liter cars Hill would finish fifth overall. He finished fourth overall in the 1986 championship behind Kroll, Bill Tempero and fellow 2-liter competitor Mauro Lanaro. 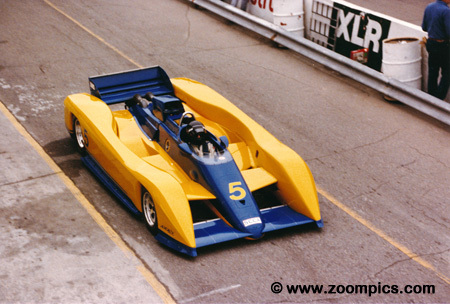 Dennis Ehrie competed in a converted Brabham BT-40 powered by a Mazda Rotary. Ehrie started at the back of the field but as the result of attrition finished sixth overall. While never the fastest, the car’s reliability and his consistency meant Ehrie never finished any worse than tenth place. Cresting the hill at corner two is second quickest qualifier Al Lamb in a Frissbee GR2. 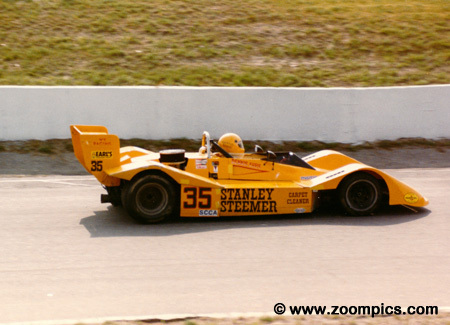 Lamb was a former Super Vee competitor who drove the car used by Rick Miaskiewcz to capture the 1985 Can Am Championship. He is followed by Dennis Ehrie in the No. 35 Stanley Steemer and the Photon of Jeremy Hill. The field lines up single file after the Chiannelli accident. After the 90-minute delay for rain and guardrail repairs, another incident would occur on the restart. The differential on Al Lamb’s Frissbee failed, causing him to crash which resulted in another caution period. Bill Adam, an experienced Canadian racer, qualified the Horst Kroll’s spare Frissbee fourth. With the race nearing its conclusion Adam appeared to be headed for a win in his first Can Am start. Unfortunately, a combination of deteriorating rain tires on a drying track forced him to surrender the lead on the last lap. Despite this problem, he held on for a second-place finish.